Outfitted in flamboyant gentleman’s attire, including a cape and Astrakahn hat, the First Doctor comes with numerous accessories including his horn handle walking cane, monocle and pipe. 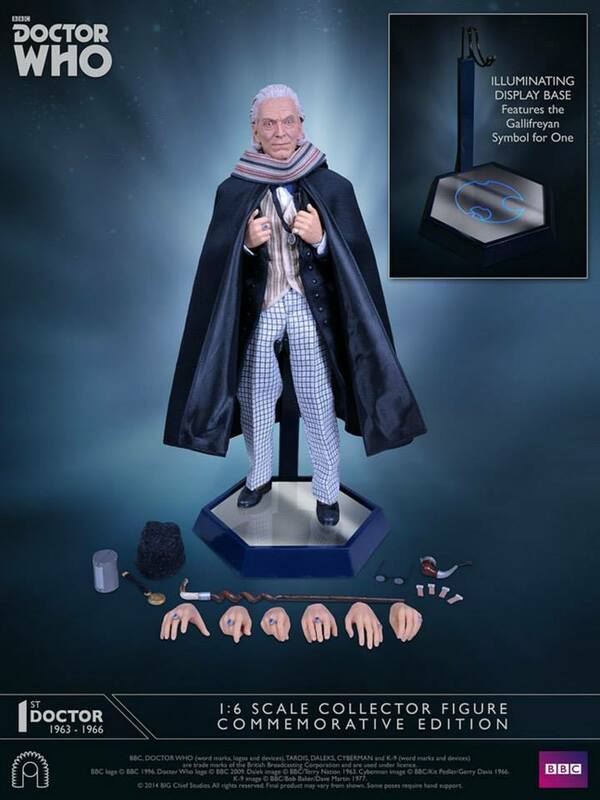 With eight interchangeable hands, to enable numerous poses and a light-up display base with the Gallifreyan symbol for one, the First Doctor 1:6 Scale Commemorative Edition is the definitive collectable for fans of the Time Lord. Officially licensed and authorised by BBC Worldwide, the First Doctor 1:6 Scale Commemorative Edition is produced in a worldwide Limited Edition exclusively available fromwww.bigchiefstudios.co.uk and will not be sold via other retailers. Each figure is numbered and includes an accompanying certificate of authenticity.